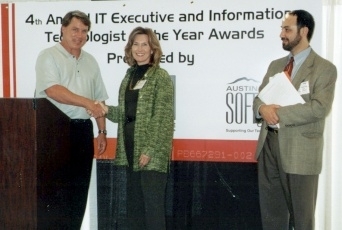 On October 24, 2001, the Austin chapter of the Association of Information Technology Professionals (AITP) presented the fourth annual Austin IT Executive of the Year Awards in conjunction with the Austin ITEC - the region's largest gathering of IT executives, educators & vendors - and the Austin Software Council. 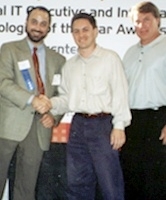 The ITEC/AITP/ASC awards ceremony was held at the Austin Convention Center, and it was attended by over one hundred area IT professionals. Austin AITP honors IT professionals in the Austin, Texas area who have demonstrated leadership skills in the areas of product or service development and benefits, team management and guidance, and overall community service. "This event continues to be an important milestone for the vibrant IT community in Austin," said AITP president, Scott Calvin. "We're proud to honor leading IT professionals such as Diana Williamson and Cathy Fulton who demonstrate measurable leadership and accomplishments." 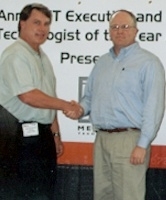 The primary sponsor of the event was Meritage Technologies. Two major awards were presented: The Austin IT Executive of the Year, and The Austin Information Technologist of the Year. At the time Ms. Williamson joined the Child Support Division of the Texas Office of the Attorney General, the technology in use by the division was aging. Ms. Williamson pushed for immediate change which lead to improved system availability and response time. She lead an effort to refresh and update the existing equipment infrastructure. While results from these efforts were impressive, Ms. Williamson saw the need to go further and develop a long-term vision and strategic plan for the use of technology within CSD. Ms. Williamson sponsored an Applications Architecture project. As a result of plan, a large number of applications improvement projects were initiated under Ms. Williamson's leadership. In September 2001, one such effort, the Texas child support program was recognized by the federal Office of Child Support Enforcement for national leadership in the areas of child support collections, fatherhood initiatives and client services. The Office of the Attorney General's child support collections exceeded $1.2 billion during the state fiscal year that ended August 31, 2001. The increase of more than $200 million over prior year collections is the largest annual increase in collections in the program's history. The Administrative Income Withholding (AIW) System contributed substantially to these collection gains. Recognizing the significance of the AIW remedy, the OAG devoted resources to fully automate the process. The automated system matches verified new hire information with OAG cases that have court orders for support. Another project, the Texas program, was the first child support program in the nation to develop an interactive web site. Child Support Interactive, an OAG website, offers customers access to case information. After entering their case and personal identification numbers, customers may check both case and payment activity on a secure part of the site. The site receives about 160,000 visits a month. In recognition of this innovative approach to customer service, Computerworld magazine named the Child Support Division an "Honors Program Laureate." The idea for an interactive web site was Ms. Williamson's. Runners-up for the award were Michael Raiford, Director, Information Technology, Samsung Austin Semiconductor and David Freeland, Deputy Commissioner, Management Information Systems, Texas Department of Human Services. Dr. Cathy Fulton is the co-founder and chief technical officer for NetQoS, an Austin company founded in January 1999 that has grown to almost 50 people and is poised for continued growth in 2002. Dr. Fulton saw a need for a technology solution aimed at improving the performance of networked applications, and founded NetQoS upon that vision. In a very short time she has led the NetQoS team to deliver two innovative products to the marketplace. NetQoS, www.netqos.com, is a provider of network performance tools and services that analyze and optimize the performance of the most demanding mission-critical networks. The company pairs its innovative software with networking services to help enterprise network managers improve performance and maximize their return on investment. NetQoS provides solutions to Fortune 1000 companies including, Schlumberger, TXU, and Compaq. 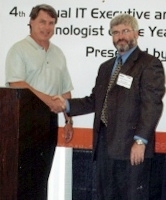 Following on the heels of the successful rollout of NetQoS' VisionQuest solution in 2000, Dr. Fulton led the conception, design and delivery of a new innovative technology product, SuperAgent, which was released on August 27, 2001. SuperAgent is an effective, easy-to-use solution for monitoring and measuring the application performance experienced by end users, and identifies the source of performance problems when they occur. SuperAgent has been warmly received by industry analysts and prospective customers. Nearly a dozen customers are currently conducting pilot evaluations of the product within their enterprises. SuperAgent is installed at such companies as Worldcom, Host Marriott, Symantec. 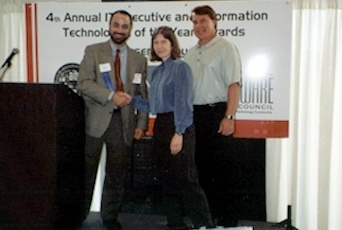 Runner-up for the award was Erin Michael Defosse, Co-Founder and Chief Technology Officer, Isochron Data Corporation. This year's recipients were chosen by Craig Dalton, President & CEO, Kazan Software, Inc., Steve Guengerich, VP of Marketing, Momentum Software, Michael Sigman, CIO, International SEMATECH, Sonia St. James, President & CEO, Technical Business Network, Paul Toprac, Executive Director, Austin Software Council, Jeff Tyler, CIO, Collective Technologies, and Larry Warnock, Partner, AV Labs.